Paralysis of the upper extremity produces major functional impairment. The ability to perform activities of daily life can be severely compromised, especially in bilateral paralysis. When muscle-tendon units remain functional in an extremity, consider sacrificing one function to restore another by transferring the working unit to a new location. Restoring something as simple as a pinch grip can create major improvement in the function of the extremity. In the latter part of the century, microvascular techniques were developed that added free muscle transfers as a possible tool for paralysis reconstruction. While newer techniques of functional electrical stimulation and microvascular transfer have added new dimensions to reconstruction, tendon transfer remains a primary tool in upper extremity paralysis management. Loss of hand function secondary to neuromuscular paralysis, tendon loss, or muscle loss can dramatically reduce a person's ability to perform normal activities of daily life. The prospect of restoring function through transfer of a muscle-tendon unit to perform one of the lost functions is enthusiastically accepted by the patient and rewarding to the surgeon. Tendon transfers may also be useful in restoring function in patients with spastic disorders due to cerebral palsy or stroke. (For more information, visit Medscape’s Stroke/Cerebrovascular Disease Resource Center. Motor dysfunction or paralysis in the upper extremities is due to traumatic or nontraumatic causes. Most commonly, trauma causes a direct, primary injury to the peripheral nervous system or the muscles and tendons. Penetrating injuries can result in transection of the median, ulnar, or radial nerves or more centrally in the brachial plexus. Blunt trauma less often affects the more peripheral nerves but is often the cause of brachial plexus or nerve root injuries. Any of the motor functions in the upper extremity may be compromised by injury to the brachial plexus or nerve roots. Direct trauma is also the leading cause of spinal cord injuries resulting in upper extremity paralysis. Paralysis from a cord injury often results in bilateral loss of function, although the losses may be different between sides. Rupture of the extensor pollicis longus (EPL) tendon is a common complication secondary to a distal radial fracture. Anatomically, the EPL tendon runs through the third extensor compartment and around the Lister tubercles. In this site, the EPL is prone to injury as a result of bony malalignment or iatrogenic injury after osteosynthesis, commonly after screw insertion from the palmar side. The EPL usually ruptures several weeks after the initial injury. Paralysis of neurologic origin may also occur from causes other than trauma, but this tends to be less responsive to surgical solutions. These causes include stroke and neurologic diseases such as multiple sclerosis or cerebral palsy. Specific loss of tendon or muscle substance can arise from rheumatologic causes, including gout and pseudogout. The tendons are usually destroyed by pannus formation, chronic inflammatory processes, uric acid, or calcium pyrophosphate depositions. These factors cause enough destruction of tendon substance that tendon transfers are required to replace lost function. Direct suture repair is not usually possible. Rheumatoid arthritis may be responsible for tendon rupture of any of the hand and wrist tendons, but it commonly leads to rupture of extensor tendons of the fingers or thumb. Denervated muscle usually loses its ability to accept reinnervation or respond to low-amplitude electrical stimulation after 9-18 months. Once the muscle has reached a point that it no longer accepts reinnervation reconstructive efforts, tendon transfers or assistive devices are required. In addition, as denervated muscle becomes fibrotic and contracted, the fibrosis may have a negative effect on the suppleness of muscles and joints. Thus, early treatment while awaiting motor reconstruction should include therapy to maintain supple joints, which is imperative for any tendon transfer. For these reasons, it is important in the acute and subacute care after an injury that produced paralysis to identify the grade 4 and 5 injuries as early as possible so that appropriate intervention can be attempted. Spinal cord paralysis presents a special consideration because the paralysis may be either upper or lower motor neuron in origin. In paralysis with an intact lower motor neuron, the muscle remains sensitive to low-amplitude stimulation. Because the muscle remains innervated, it remains indefinitely receptive to reinnervation from a nerve transfer. If the paralysis includes lower motor neuron injury, early nerve transfer or long-term tendon transfer is the only reconstructive option other than traditional assistive devices. Traumatic: High-energy wounds (eg, gunshot wounds) may produce nerve injuries of widely varying degrees. Some of these can be expected to recover spontaneously. Others are grade 4 and 5 injuries that may span long segments. Central gunshot wounds tend to produce unpredictable patterns of both upper and lower motor neuron injury. Conversely, low-energy injuries (eg, sharp penetrating wounds) produce disruption of the peripheral nerve in short segments, making these appropriate for successful nerve repair. For blunt injuries, the grade of injury is difficult to determine initially. Nontraumatic: A history of rheumatoid arthritis, other synovial arthritis, or gout/pseudogout raises the suggestion of tendon rupture. Rupture secondary to synovial processes almost always requires tendon transfers or grafts. Direct repair is not usually possible because of segmental loss of tendon substance. In otherwise healthy individuals, a recent history of viral illness suggests paralysis of viral origin, such as anterior interosseous nerve palsy. Limited observation may be indicated in these patients. An important part of the history includes determining the expectations of the patient regarding long-term function. The patient's expectations need to be appropriate to the options available. A patient with overly ambitious expectations may be quite unhappy with more modest outcomes. In addition, tendon transfers require a lengthy recovery period and should not be performed in patients who will not or cannot adequately comply with therapy. The physical examination should be thorough, with particular concern to the status of joints, the status of sensation, soft tissue coverage, which muscles are functioning, and which functions are missing. The authors' preference is to record sensation by dermatome, note soft tissue coverage, and record the suppleness of all involved joints. The authors proceed from proximal to distal with a manual muscle examination. This starts with examination of the shoulder, with attention to the function of the deltoid (anterior, middle, posterior), latissimus, and pectoralis, and an assessment of shoulder subluxation. Next, test the triceps and biceps group, then the brachioradialis (BR). The examination should assess functions of pronation, supination, wrist extension, and flexion. With wrist extension, the authors attempt to determine whether extension is produced by only the extensor carpi radialis longus (ECRL) or by both the ECRL and the extensor carpi radialis brevis (ECRB). Differentiating between extension produced by the ECRL or both the ECRL and the ECRB may be difficult and ultimately requires examination in the operating room. Because both the flexor carpi radialis and the flexor carpi ulnaris (FCU) may be useful for transfers, determine the function of both. Next, the function of finger and thumb flexion and extension is checked. This is followed by evaluation of the intrinsic muscle function of the hand. Of particular concern are opposition of the thumb and the presence of "clawing" of any fingers, as shown below. Ulnar clawing produced by loss of intrinsics to the little and ring fingers, characterized by hyperextension of the metacarpophalangeal joints and flexion of the interphalangeal joints. After identifying lost function, the examiner should assess that joints are supple and passively unrestricted in movement. Only under this premise is tendon transfer possible. Finally, the donor muscles and tendons must be checked for presence and function. The palmaris longus tendon can be felt in wrist flexion with opposition of the thumb and little finger. The extensor indicis proprius tendon usually lies ulnarly of the extensor digitorum communis (EDC)–2 tendon. It is present if the index finger can be extended with complete flexion of the other fingers. A thorough examination may also help to determine the etiology of the paralysis. This is especially important in nontraumatic cases, in which differentiation between nerve paralysis and tendon rupture is important. Testing for a natural tenodesis effect helps establish the cause (see below). For finger paralysis, the wrist is extended and flexed. 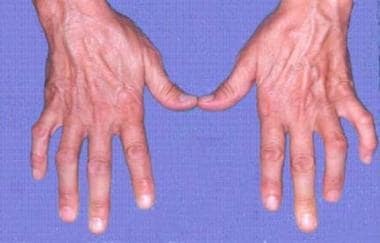 Tenodesis movement of the fingers implies a neurologic problem, while loss of tenodesis movement implies tendon rupture. Natural tenodesis is demonstrated by flexing and extending the wrist with the hand relaxed. 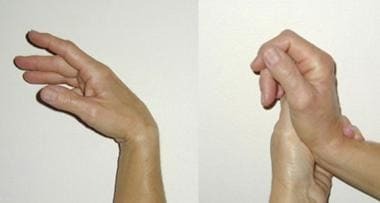 The effect shows extension of the fingers when the wrist is flexed and flexion of the fingers when the wrist is extended. If the tendons are not intact, this effect is lost. Assessing the degree of nerve injury and the chance of recovery is important for adequate early treatment. An electrodiagnostic evaluation of peripheral nerve injury is used for this purpose. Nerve conduction studies, both sensory and motor, are useful early after an injury to distinguish neurapraxia from axonotmesis or neurotmesis. The hallmark of a neurapraxic injury is a slowing or complete block of nerve conduction along a segment of nerve. The absence of a nerve conduction response in a distal nerve segment indicates a loss of axons (axonotmesis or neurotmesis). Serial nerve conduction studies show a progressive diminution in the amplitude of the response after 48-72 hours as wallerian degeneration of the axons occurs. Two to 3 weeks after an axonotmetic or neurotmetic injury, the results of electromyography (EMG) become abnormal. Spontaneous activity, including fibrillations, fasciculations, and positive sharp waves, develops in the affected muscles. The results of EMG performed after a neurapraxic injury usually remain normal and can help distinguish a neurapraxic injury from the more severe axonotmetic and neurotmetic injury. EMG can help detect regeneration only at the stage during which nerve fibers begin to reinnervate their target muscles. In clinical practice, serial EMG at 6- to 12-week intervals helps identify recovering muscle. If evidence of reinnervation is not present at 3 months, especially in muscles close to the level of injury, spontaneous recovery is unlikely. When considering tendon transfers, the primary indication for surgery is the need to replace or reconstruct an absent function. To reconstruct a function, certain other requirements must be met. Joints that are required to move must be supple. A transferred tendon trying to move a stiff joint is doomed to failure. If joints are not sufficiently supple, they must be loosened, preferably by hand therapy. If hand therapy fails, surgical release of the joints may be required prior to tendon transfer. Use passive motion exercises to maintain joint flexibility after surgical release. Allow sufficient time to allow all surgically induced tissue trauma adequately heal. The author usually waits at least 3 months, but preferably 6 months, before proceeding with transfers. If sensation in the hand is absent, strongly consider restoring at least protective sensation prior to or at the time of tendon transfer. Even with normal motor function, an anesthetic hand is difficult to use; in a hand with transferred tendons, it may be impossible. To restore functional motion to a hand or forearm, a suitable donor must be available. Generally, a suitable donor is a normally innervated muscle that is providing a redundant function. Redundancy is not absolutely necessary provided that the function to be sacrificed is not of vital importance to the overall function of the extremity. Except in unusual circumstances, a reinnervated muscle is considered a poor choice for a donor. The timing of a tendon transfer after an injury depends on the likelihood of spontaneous reinnervation and nerve recovery. If nerve repairs or nerve transfers were performed initially, then sufficient time should be allowed to determine the outcome of the initial treatment before considering tendon transfers. Keep in mind that axons regenerate at a rate of approximately 1 mm/d. If one cannot determine from the initial injury whether the nerve was interrupted (neurotmesis) and if the clinical examination reveals a loss of motor or sensory function, determining if adequate recovery is likely is mandatory before considering tendon transfer as a reconstructive option. EMG performed immediately and then again at 6 weeks helps to determine which functions may be expected to recover. Lack of evidence of innervation at 6 weeks should prompt exploration and repair if possible. Once sufficient time has elapsed to allow for spontaneous or repaired recovery, consider reconstruction for missing functions. Select donor muscles that provide a synergistic action to the function to be restored. Wrist extensors and finger flexors are an example of a synergistic group. In normal activity, wrist extensors contract when finger flexion is initiated. This action stabilizes the wrist, maximizing the effect of the finger flexors. This makes wrist extensors good choices for transfer to provide finger flexion. The wrist extensor normally contracts simultaneously with finger flexors; this makes postoperative motor reeducation simpler. Other synergistic muscle groups include (1) wrist flexors and thumb/finger extensors and (2) the extensor indicis proprius (EIP) and extensor pollicis longus (EPL). On the contrary, muscles that normally relax while another is active are more difficult for a patient to learn to control. These are considered nonsynergistic, or out of phase. An example would be the use of a wrist flexor to provide finger flexion or a wrist extensor to provide finger extension. Muscles that have no direct functional relationship to a particular function may provide excellent donors. This is true of the BR, which is often chosen to replace finger or thumb flexion, wrist extension, or finger or thumb extension. The strength, excursion, and usual redundancy of the brachioradialis (BR) make it a frequent choice as a donor for multiple functions. The pronator teres (PT) is a good replacement for wrist extension. In addition to considering appropriate donors, pay attention to matching, as closely as possible, a donor's excursion and work capacity with the function to be replaced. Work capacity generally corresponds to the cross-sectional area of the muscle, while excursion is related to muscle fiber length. Transferring a muscle-tendon unit that does not need to be extended by a graft is desirable, but not absolutely necessary. In cases in which an appropriate donor cannot reach the desired recipient, an interposed tendon graft is acceptable. Donors should be used to provide only one function and, when possible, should cross only one joint. Transfers that cross 2 joints and are expected to produce motion in both add a level of demand to the restoration of function that may not be achievable. If traversing more than one joint is necessary, appropriate stabilization of one of the joints is desirable to maximize function. For instance, triceps function is desirable when using the BR transfer in which stabilizing the elbow in extension improves the transfer function. Similarly, expecting a transferred muscle-tendon unit to provide more than one function produces disappointing results. The only absolute contraindication to tendon transfer is a lack of appropriate donors. The availability of muscle-tendon units with less than grade 5 strength is a relative contraindication. Similarly, if only muscles that have been denervated and then reinnervated are available, this is also a relative contraindication. Transfers planned in individuals with progressive neuromuscular diseases should be carefully considered before proceeding because the underlying disease process may affect the transferred unit. Lastly, satisfactory results are difficult to achieve in transfers performed to produce motion in less-than-supple joints. Burkhalter WE. Early tendon transfer in upper extremity peripheral nerve injury. Clin Orthop Relat Res. 1974 Oct. 0(104):68-79. [Medline]. Burkhalter WE. Tendon transfers in brachial plexus injuries. Orthop Clin North Am. 1974 Apr. 5(2):259-70. [Medline]. Moberg E. Reconstructive hand surgery in tetraplegia, stroke, and cerebral palsy: some basic concepts in physiology and neurology. J Hand Surg [Am]. 1976 Jul. 1(1):29-34. [Medline]. Riordan DC. Tendon transfers in hand surgery. J Hand Surg [Am]. 1983 Sep. 8(5 Pt 2):748-53. [Medline]. Zancolli EA. Claw-hand caused by paralysis of the intrinsic muscles: a simple surgical procedure for its correction. J Bone Joint Surg Am. 1957 Oct. 39-A(5):1076-80. [Medline]. Sunderland S. The anatomy and physiology of nerve injury. Muscle Nerve. 1990 Sep. 13(9):771-84. [Medline]. Rath S. Split flexor pollicis longus tendon transfer to A1 pulley for correction of paralytic Z deformity of the thumb. J Hand Surg Am. 2013 Jun. 38(6):1172-80. [Medline]. Iba K, Wada T, Hiraiwa T, Kanaya K, Oki G, Yamashita T. Reconstruction of Chronic Thumb Metacarpophalangeal Joint Radial Collateral Ligament Injuries With a Half-Slip of the Abductor Pollicis Brevis Tendon. J Hand Surg Am. 2013 Aug 5. [Medline]. Davidge KM, Yee A, Kahn LC, Mackinnon SE. Median to radial nerve transfers for restoration of wrist, finger, and thumb extension. J Hand Surg Am. 2013 Sep. 38(9):1812-27. [Medline]. Van Heest AE, Bagley A, Molitor F, James MA. Tendon transfer surgery in upper-extremity cerebral palsy is more effective than botulinum toxin injections or regular, ongoing therapy. J Bone Joint Surg Am. 2015 Apr 1. 97 (7):529-36. [Medline]. Schaller P, Baer W, Carl HD. Extensor indicis-transfer compared with palmaris longus transplantation in reconstruction of extensor pollicis longus tendon: a retrospective study. Scand J Plast Reconstr Surg Hand Surg. 2007. 41(1):33-5. [Medline]. Jones NF, Machado GR. Tendon transfers for radial, median, and ulnar nerve injuries: current surgical techniques. Clin Plast Surg. 2011 Oct. 38(4):621-42. [Medline]. Isaacs J, Ugwu-Oju O. High Median Nerve Injuries. Hand Clin. 2016 Aug. 32 (3):339-48. [Medline]. Brunelli GA, Brunelli GA. Reconstructive surgery for permanent palsy of the median nerve. Surg Technol Int. 2004. 13:268-75. [Medline]. Chadderdon RC, Gaston RG. Low Median Nerve Transfers (Opponensplasty). Hand Clin. 2016 Aug. 32 (3):349-59. [Medline]. Cheah AE, Etcheson J, Yao J. Radial Nerve Tendon Transfers. Hand Clin. 2016 Aug. 32 (3):323-38. [Medline]. Kozin SH. Tendon transfers for radial and median nerve palsies. J Hand Ther. 2005 Apr-Jun. 18(2):208-15. [Medline]. Ropars M, Dreano T, Siret P, et al. Long-term results of tendon transfers in radial and posterior interosseous nerve paralysis. J Hand Surg [Br]. 2006 Oct. 31(5):502-6. [Medline]. Wehrli L, Bonnard C, Anastakis DJ. Current status of brachial plexus reconstruction: restoration of hand function. Clin Plast Surg. 2011 Oct. 38(4):661-81. [Medline]. Lieber RL, Murray WM, Clark DL, et al. Biomechanical properties of the brachioradialis muscle: Implications for surgical tendon transfer. J Hand Surg [Am]. 2005 Mar. 30(2):273-82. [Medline]. Sultana SS, MacDermid JC, Grewal R, Rath S. The effectiveness of early mobilization after tendon transfers in the hand: a systematic review. J Hand Ther. 2013 Jan-Mar. 26(1):1-20; quiz 21. [Medline]. Rath S. Immediate active mobilization versus immobilization for opposition tendon transfer in the hand. J Hand Surg [Am]. 2006 May-Jun. 31(5):754-9. [Medline]. Germann G, Wagner H, Blome-Eberwein S, et al. Early dynamic motion versus postoperative immobilization in patients with extensor indicis proprius transfer to restore thumb extension: a prospective randomized study. J Hand Surg [Am]. 2001 Nov. 26(6):1111-5. [Medline]. Hobby J, Taylor PN, Esnouf J. Restoration of tetraplegic hand function by use of the neurocontrol freehand system. J Hand Surg [Br]. 2001 Oct. 26(5):459-64. [Medline]. Hausman MR, Masters JE. Percutaneous Freehand system intramuscular electrode placement. J Hand Surg [Br]. 2002 Oct. 27(5):465-9. [Medline]. Boyes JH. Tendon transfers for radial nerve palsy. Bull Hosp Joint Dis. 1960. 21:97-105. Brand PW. Tendon transfers for median and ulnar nerve paralysis. Orthop Clin North Am. 1970 Nov. 1(2):447-54. [Medline]. Brand PW, Beach RB, Thompson DE. Relative tension and potential excursion of muscles in the forearm and hand. J Hand Surg [Am]. 1981 MAY. 6(3):209-19. [Medline]. Bunnell S. Restoring flexion to the paralytic elbow. J Bone Joint Surg Am. 1951 Jul. 33-A(3):566-71: passim. [Medline]. Castro-Sierra A, Lopez-Pita A. A new surgical technique to correct triceps paralysis. Hand. 1983 Feb. 15(1):42-6. [Medline]. Cooney WP. Tendon transfer for median nerve palsy. Hand Clin. 1988 May. 4(2):155-65. [Medline]. Eversmann WW Jr. Tendon transfers for combined nerve injuries. Hand Clin. 1988 May. 4(2):187-99. [Medline]. Freehafer AA, Peckham PH, Keith MW. Determination of muscle-tendon unit properties during tendon transfer. J Hand Surg [Am]. 1979 Jul. 4(4):331-9. [Medline]. Freehafer AA, Peckham PH, Keith MW, Mendelson LS. The brachioradialis: anatomy, properties, and value for tendon transfer in the tetraplegic. J Hand Surg [Am]. 1988 Jan. 13(1):99-104. [Medline]. Friden J, Ponten E, Lieber RL. Effect of muscle tension during tendon transfer on sarcomerogenesis in a rabbit model. J Hand Surg [Am]. 2000 Jan. 25(1):138-43. [Medline]. Gellman H, Kan D, Waters RL, Nicosa A. Rerouting of the biceps brachii for paralytic supination contracture of the forearm in tetraplegia due to trauma. J Bone Joint Surg Am. 1994 Mar. 76(3):398-402. [Medline]. Hastings H 2nd, Davidson S. Tendon transfers for ulnar nerve palsy. Evaluation of results and practical treatment considerations. Hand Clin. 1988 May. 4(2):167-78. [Medline]. Hentz VR, Hamlin C, Keoshian LA. Surgical reconstruction in tetraplegia. Hand Clin. 1988 Nov. 4(4):601-7. [Medline]. House JH, Gwathmey FW, Lundsgaard DK. Restoration of strong grasp and lateral pinch in tetraplegia due to cervical spinal cord injury. J Hand Surg [Am]. 1976 Sep. 1(2):152-9. [Medline]. Keith MW, Kilgore KL, Peckham PH, et al. Tendon transfers and functional electrical stimulation for restoration of hand function in spinal cord injury. J Hand Surg [Am]. 1996 Jan. 21(1):89-99. [Medline]. Manktelow RT, Zuker RM, McKee NH. Functioning free muscle transplantation. J Hand Surg [Am]. 1984 Jan. 9A(1):32-9. [Medline]. Mayer L, Green W. Experiences with the Steindler flexorplasty at the elbow. J Bone Joint Surg Am. 1954 Jul. 36-A(4):775-89; passim. [Medline]. Mendelson LS, Peckham PH, Freehafer AA, Keith MW. Intraoperative assessment of wrist extensor muscle force. J Hand Surg [Am]. 1988 Nov. 13(6):832-6. [Medline]. Palande DD. The role of muscle reeducation in dynamic tendon transfer surgery of the hand. Handchirurgie. 1979. 11(3-4):195-7. [Medline]. Schantz K, Riegels-Nielsen P. The anterior interosseous nerve syndrome. J Hand Surg [Br]. 1992 Oct. 17(5):510-2. [Medline]. Thomas CK, Erb DE, Grumbles RM, et al. Embryonic cord transplants in peripheral nerve restore skeletal muscle function. J Neurophysiol. 2000 Jul. 84(1):591-5. [Medline]. Van Heest A, Hanson D, Lee J, et al. Split flexor pollicus longus tendon transfer for stabilization of the thumb interphalangeal joint: a cadaveric and clinical study. J Hand Surg [Am]. 1999 Nov. 24(6):1303-10. [Medline]. Williams HB. The value of continuous electrical muscle stimulation using a completely implantable system in the preservation of muscle function following motor nerve injury and repair: an experimental study. Microsurgery. 1996. 17(11):589-96. [Medline]. Assist devices used in upper limb paralysis. Tendons ruptured secondary to rheumatoid arthritis. Repair by transfer of long extensor digitorum communis (EDC) to the ring EDC and the index EDC to the little EDC. The fourth dorsal compartment has been opened to allow inspection of the compartment and repair of any problem causing the ruptures. Zancolli-type lasso of A-1 pulley by the superficialis. Extensor indicis proprius transfer to the extensor pollicis longus. Side-by-side adjustments of the profundus or extensor tendons for extrinsic balance. Split flexor pollicis longus transfer for stabilization of the interphalangeal joint. The neuromuscular stimulator is useful for intraoperative evaluation of tendon excursion and transfer function. Pulvertaft weave used to connect tendon grafts. Test excursion and transfer function using a neuromuscular stimulator. Opponensplasty using the extensor indicis proprius for treatment of low median nerve palsy. Flexor reconstruction in brachial plexus injury using a brachioradialis to flexor digitorum profundus transfer and a pronator teres to flexor pollicis longus transfer along with extensor tenodesis for release. Flexor reconstruction in a tetraplegic patient using a extensor carpi radialis longus to flexor digitorum profundus transfer and a pronator teres to flexor pollicis longus transfer along with a split flexor pollicis longus transfer to stabilize the interphalangeal joint. The authors and editors of eMedicine gratefully acknowledge the contributions of previous author Philip E Higgs, MD, to the development and writing of this article.